OK, so maybe I’m a little biased and just a touch geocentric. I’m old-fashioned that way. But I think I’m being fair when I say that Earth is the best planet in the Solar System, and it’s not even a close call. The most famous photograph in the world: “The Blue Marble” taken on the Apollo 17 lunar mission in 1972. Blue waters, swirling white clouds, rainy temperate zones, harsh deserts, snow-capped mountain peaks, deep ocean trenches. Every nook and cranny of Earth is bursting with life, from desert ecosystems to subterranean Antarctic lakes to undersea reefs to tropical rainforests. The plants and animals and single-celled organisms of our planet stabilize its temperature and its atmosphere, preventing it from turning into the ice planet Hoth and replenishing it with life-giving oxygen that is all but absent on any other planet we know. Circling our planet is a massive Moon that generates ocean tides and stabilizes Earth’s tilt, ensuring regular seasonal cycles and ocean currents that circulate nutrients throughout the planet’s ecosystems. We as humans have thrived on this planet, multiplying across it and finding ways to survive in just about every niche and ecosystem above sea level. Some of us have accessed a planetary information network called the Internet and voted on this very blog that Earth is the worst planet in the Solar System. This is because we are sometimes ungrateful and dumb. Every day we see and hear beauty all around us, and we take for granted the air we breathe, the water we drink, and the food we eat, neither of which we can find on any other planet in the Solar System. Earthrise as viewed from Apollo 8 as it orbited the Moon in 1968. In a thousand years, we could not exhaust the richness of Earth. Our planet is not merely the crown jewel of the Solar System; it is the greatest wonder of the universe. Thanks for reading! Next week I will return to blogging on whatever I feel like. I’m committing to increasing my blogging rate from once a year to once a week, which is a big step up. While you wait for that, go ahead and cast your vote for the best and worst planets in the Solar System. Now we come to the king of the planets, the undisputed heavyweight champion of our Solar System. Jupiter is a straight up amazing planet. First of all, as we’ve already mentioned, it’s the heaviest planet. In fact, it’s twice as massive as the other seven planets combined. It’s so massive that it alters the center of mass of our Solar System—the Solar System (including the Sun) revolves around a point just beyond of the surface of the Sun. It’s so massive that, if you were to throw more matter into it, it wouldn’t even get any bigger than it is because the sheer gravitational pull would cause the planet to contract in on itself. Yes, Jupter is a big boy. Jupiter is also super energetic. It emits more radiation than it receives from the sin. Once Venus disappears behind the horizon, Jupiter is the brightest “star” in the night sky—bright enough to cast shadows on Earth. You can’t hide from Jupiet. You’ll need more than Neutrogena to make this case of acne go away. Jupiter has the most dramatic surface features outside of Earth. It’s got colourful bands of clouds in its atmosphere, and outrageous ovals of red and white sprinkled across its surface. These ovals are storm systems, some as large as Earth itself. 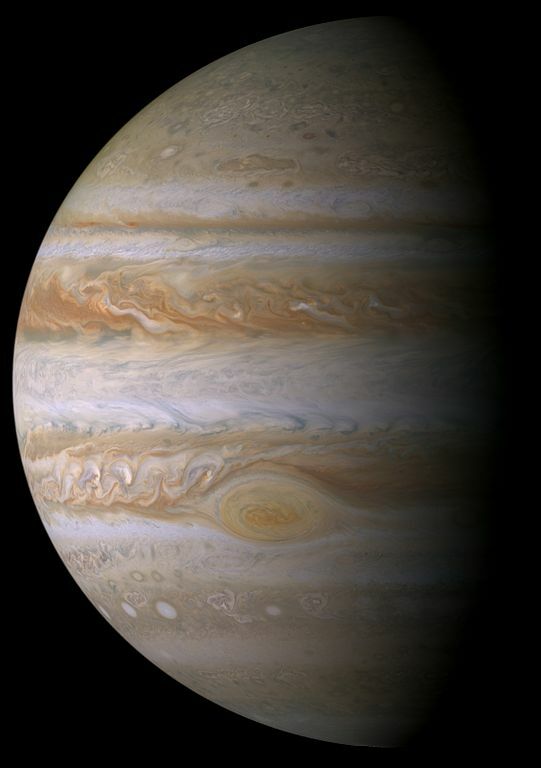 The famous Great Red Spot, in fact is larger than two Earths and has spun around Jupiter for hundreds of years. Jupiter has a super powerful magnetic field that sweeps out as far as the orbit of Saturn. If you were to travel through Jupiter’s magnetic field, you’d be cooked by all the energetic particles trapped along the field lines. So don’t do that. Seriously, Callisto might be the forgotten middle child of these four “Galilean moons.” I mean…it’s a good moon, better than the moons of nearly every other planet…but in the Jupiter family, it struggles to stand out. Such is life. Callisto, why can’t you be more like your brothers and sisters? So even though Jupiter isn’t really a great place to visit unless you’re a specially designed robotic probe, it’s still the second-best planet in the Solar System. And that’s no small feat, because the best planet is freakin’ unbelievable. Bet you can’t guess which one it is. If you were a Galilean moon, which one of the four would you be? Let us all know in the comments below, and then vote for the BEST planet and the WORST planet in our Solar System! The Miss Universe competition has been a sham for decades now thanks to its Earthling bias. Everyone knows that the real Miss Universe is found elsewhere in our Solar System. God liked it, so he put a ring on it. Saturn features the largest and priciest hula hoop in the Solar System. As we move on from the gaggle of lousy and mediocre planets littering our Solar System, we arrive at one that I seriously considered for the #2 spot in my ranking of the eight planets. Saturn is beautiful. Just look at her! Indeed, the most beautiful of all billiard balls. Now, we could drool all day over photos from the Voyager probes and the Cassini-Huygens mission. But for most of human history, no one had any idea that Saturn was so lovely. It was just another bright wandering speck in the sky that came to be known as a planet. Then finally, Galileo peered through his rudimentary telescope and discovered that this particular planet had a couple of lumps sticking out of the side. Christiaan Huygens had a better telescope and determined that these lumps were—improbably enough—rings! How bizarre an experience that must have been! Saturn’s rings are composed of a bazillion little chunks of ice and rock, shepherded by a handful of tiny moons that zip around the gas giant. The rings are beautiful, but unfortunately, Saturn really only has two good moons. The first good moon is Mimas, because it looks like the Death Star. The second good moon is Titan, which contains 90% of the mass in orbit around Saturn (rings and moons included), is larger than the planet Mercury, and is the only moon in the solar system with an atmosphere. Underneath the yellow smog lie several lakes of liquid methane and ethane, off limits to swimmers even during peak season. As for Saturn itself, once you peel away the rings, you’re left with a planet that is unfortunately rather low in density, bland in appearance, and a little squashed looking. I’m the sort of guy who prefers planets with a lively and vivacious personality, so despite its serene splendour, Saturn only lands at #3 on my list. If you prefer to put Saturn at #2, that’s OK by me; just don’t hand this planet the Miss Congeniality award or anything. One last look for you Saturn groupies out there! I hear that angelic haloes are fashionable in Paris these days. How much airfare would you pay to go and watch a beauty pageant of all the planets? Let us all know in the comments below, and then vote for the BEST planet and the WORST planet in our Solar System! Choosing which planet is better—Uranus or Neptune—is like choosing which of your twin daughters you prefer. They’re so much alike! And how could you bring yourself to choose between them? However, I was able to make the decision for you because unlike you, dear reader, I don’t have twin daughters. So you can trust my cold, forbidding judgment in regard to these cold, forbidding gas giants. If Neptune and Uranus were in a race to see which could get around the Sun faster, Uranus wins, hands down. But sorry Uranus, nobody really cares. In a race to see which planet is the better of the two, it’s twin sister Neptune by a nose. Both are distant spheres of gas and ice, circling the Sun in hypothermic mediocrity, but Neptune has a few positive traits that make it more worthy of its planetary title. First of all, Neptune has a pretty good moon. Unlike Uranus, which has amassed a rabble of lousy Shakespearean satellites, Neptune has focused nearly all of its extracurricular efforts on capturing a single quality moon which astronomers aptly named Triton, after the son of the Roman god Neptune. *WHOOOOSSHH* That’s the sound effect I imagine for the Great Dark Spot as it zips across the face of Neptune. Which brings us, stream-of-consciousness style, to the way Neptune itself got its name. This is my favourite trinket of Neptunian trivia. Neptune was the first and only planet to be theoretically predicted before it was discovered. A British astronomer named John Couch Adams and a French astronomer named Urbain Le Verrier independently calculated that the orbit of Uranus was being affected by the gravitational pull of yet another planet. Le Verrier’s friends at the Berlin Observatory were the ones to identify the new planet first. Initially, Le Verrier wanted to name the planet Neptune. Then he decided that this name was failing to feed his mammoth hubris, so he renamed it Le Verrier. Meanwhile, the British were all in a huff that their man Adams wasn’t getting his share of the credit, so finally all the astronomers agreed that Le Verrier’s name was stupid, that the planet’s name would be Neptune, and that everybody should get a trophy for finding it. Yes, the history of Neptune’s discovery is a tale of political intrigue. That in itself makes it better than Uranus. Beyond this, I suppose Neptune is the more beautiful planet. For some reason as yet unknown, it has escaped becoming a bland cyan orb and has blossomed into a beautiful azure-blue marble, dotted with dark storms and wisps of white clouds. In a beauty contest, Neptune wins the prize over her drab twin sister. But you know, if you think Uranus is better than Neptune, I will listen to your arguments, perhaps even without falling asleep. Leave a comment below expressing your opinion on Uranus and Neptune, then scroll back up and vote for the best planet and the worst planet in our Solar System!